When I think of GoVideo, I think of their dual deck VHS players. 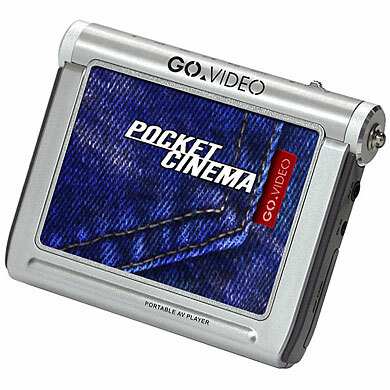 In a couple weeks they will be adding to their innovative lineup, the PVP-4040 3.5 inch LCD PocketCinema Recorder. This nifty device can playback MPEG-4 audio and video, MP3, DivX 5.0, MPG, AVI, MP4, DAT, WMV, and ASF. It also can record in three modes, built in 128 MB flash memory stores 110 minutes in Good, 55 minutes in Better, and 27 minutes in Best. Transfer media from your PC with high speed USB 2.0, or import media in real time using the A/V input. It also supports SD cards so you can watch or record even more content… perfect for that long flight. The best part about the PVP-4040 is the price… it can be had for about $300 shipped… making this is one of the least expensive portable media players available.